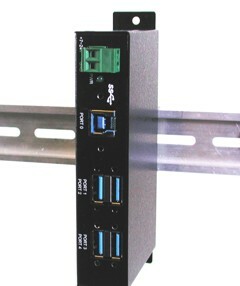 This rugged, industrial-strength 4-port USB 3.0 Hub is a small form factor industrial USB 3.0 Hub. 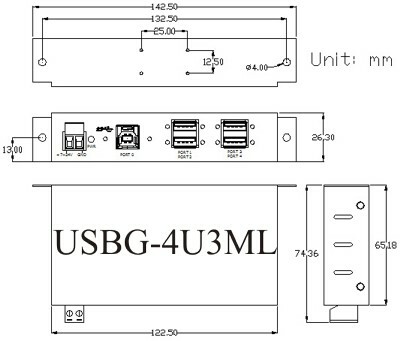 The USBG-4U3ML design is small but an industrial/military grade hub featuring extended temperature operation (0°C to 55°C), Screw-Lock high retention USB connectors, and an industrial steel enclosure for shock and vibration mitigation. 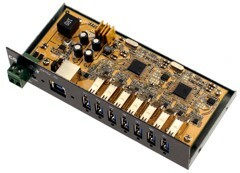 The USBG-4U3ML now makes it easy to add additional USB-based I/O to your embedded system or to connect peripherals such as external hard drives, keyboards, GPS, wireless and more. This item Designed for markets that include Industrial Automation, Embedded OEM, Laboratory, Kiosk, Transportation/Automotive, and Military/Government. It provides an ideal solution to expand 4 USB 3.0 ports from one single USB 3.0 host port. It provides a wide range self power source (+7~24VDC from 2-pin Terminal Blocks) to provide enough power on USB 3.0 buses. No driver installation is required for the USBG-4U3ML product. Any USB compliant operating system will automatically install it. It will enumerate as a Generic Hub which uses the USB Hub Class Driver that is built into USB compliant operating systems such as Linux (including Mac OS X) and Windows. Though the standard USB cable is made for easy plugging and removing, it is critical to have reliable connections while operating for automation control and online production applications. Coolgear combines these two attributes into its USB modules; with the lockable casing accessory for type A USB connector, each device could be linked easily and resist vibration at the same time, rising the convenience and reliability of the control system ST4300USBMS.